Sometimes you just have to take it back to the basics to get the most out of an evening! For me, the basics includes a fresh-from-the-oven pizza and a cold beer. 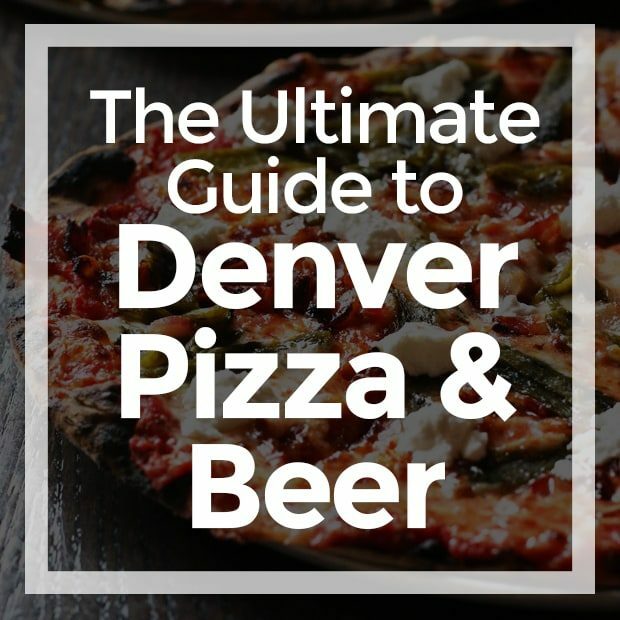 The Ultimate Guide to Denver Pizza and Beer is my guide to some favorite pizza and beer spots around the city. This guide is all about the hidden gems around the city that aren’t packed to the gills with patrons at all hours of the day. Instead, these spots are my go-to’s for a relaxing evening of great food, killer Denver beer and atmosphere. 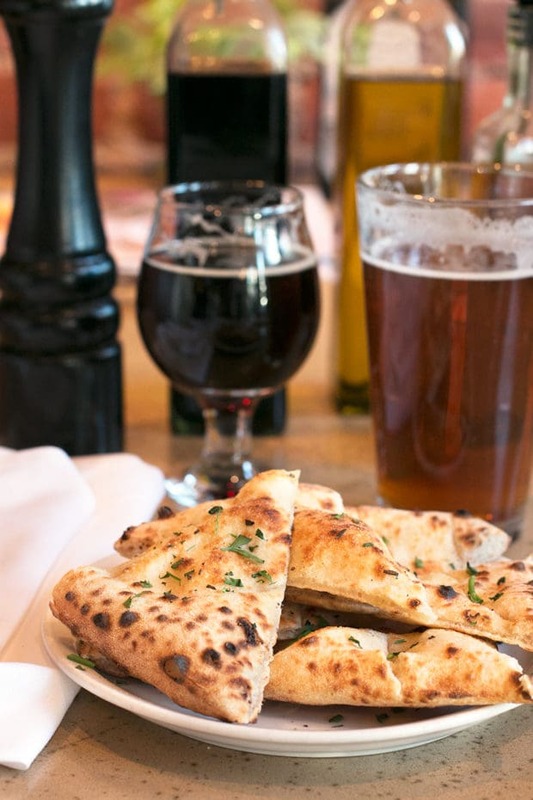 My favorite Denver neighborhoods, the best pizza and craft brewery pairings. I’ll let you decide which one is your fave! Pizza and beer is one of my favorite combination in the world. A warm slice of pizza and a cold beer always satisfy my taste buds, especially now that you can bring pizzas into most of your favorite breweries around Denver! Personally I like to make a night of it, starting with pizza and a beer from the pizzeria’s tap list, then ending the night at a killer brewery that’s just down the street (or right next door!). The truth is, you can never go wrong with a night of pizza and beer. 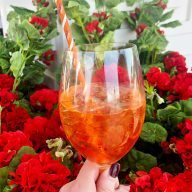 With so many options around Denver, it’s hard to narrow down the list of my favorites… Instead of loading you up with an endless list, I’m dedicating this guide to a few of my favorite Denver neighborhoods that won’t have you waiting two hours to get a slice, or living in cramped standing room only taprooms. These spots are all centrally located around the city, and will help you experience a couple of neighborhoods in Denver that you may not have explored before. Try them all, then be sure to pop back here and tell me which was your winning combination for your fave Denver pizza and beer! I’m starting off this round up of Denver pizza and beer in one of the closest neighborhoods to the center of town. Situated right by the Ballpark, this pizza and beer match up is ideal for those of you getting your chow on before or after a Rockies game! 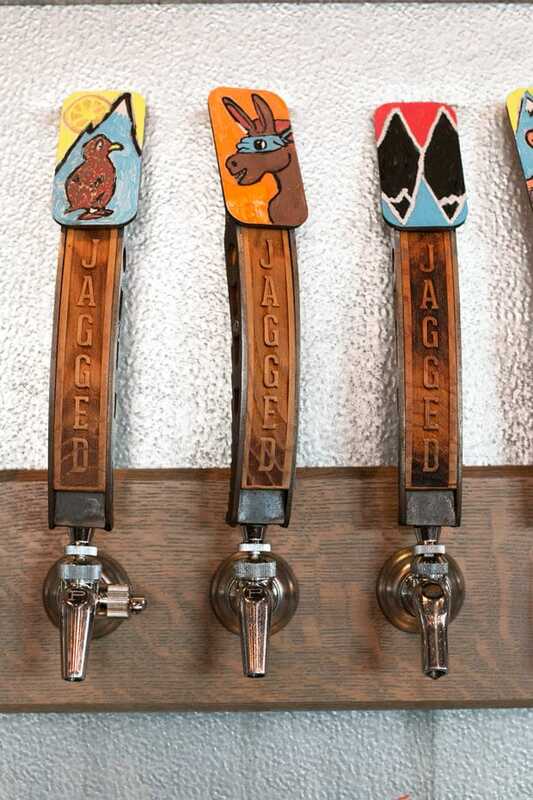 Jagged Mountain Brewery – finding an actual brewery in downtown Denver isn’t as easy as you would think until you get to RiNo and other bordering areas of downtown Denver like the Highlands. Jagged Mountain Brewery changed all that by coming in and setting up shop close to the Ballpark. With a large tap room and a playful tap list, the brewery really holds its own with a strong core of beers and seasonal specials. What stands out to me about this spot is the true Colorado vibe, from the tap room itself to the fun beer names and tap handles, you feel like you are in a true Denver local spot the moment you walk in the door. 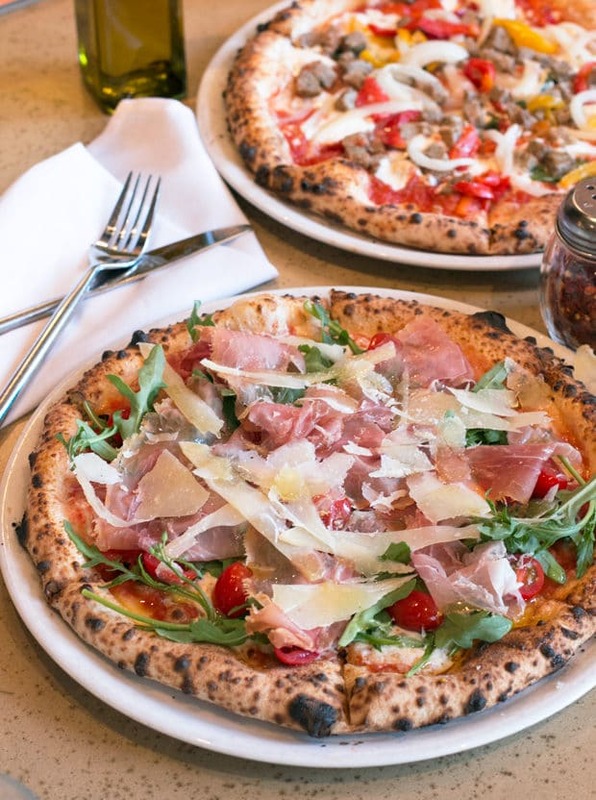 Racca’s Pizzeria Napoletana – there are times that I want to satisfy my craving for true Italian pizza, and when I do, I head straight to Racca’s in the Ballpark district. I mean, when a pizza place has ovens that were flown in from Italy and get up to 1000 degrees, you kind of have to make a stop for a slice (or ten). 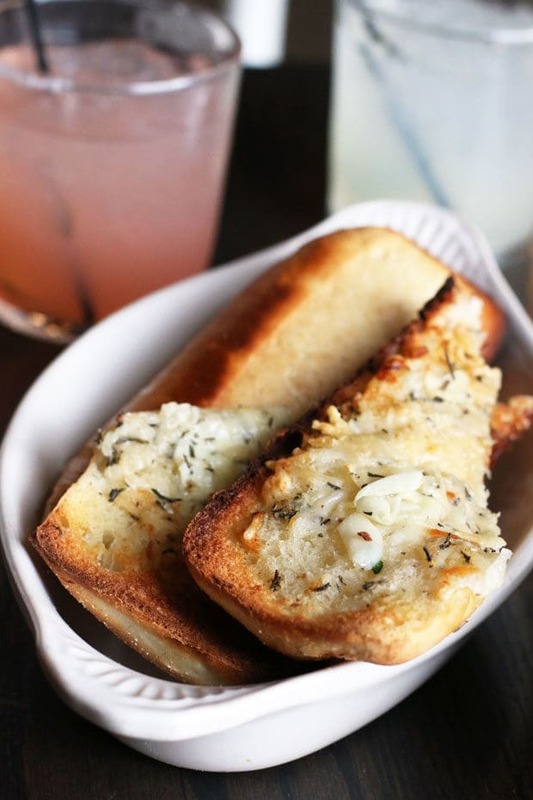 Everything Racca’s serves up is made in their blistering hot ovens, from their focaccia to their pizzas. 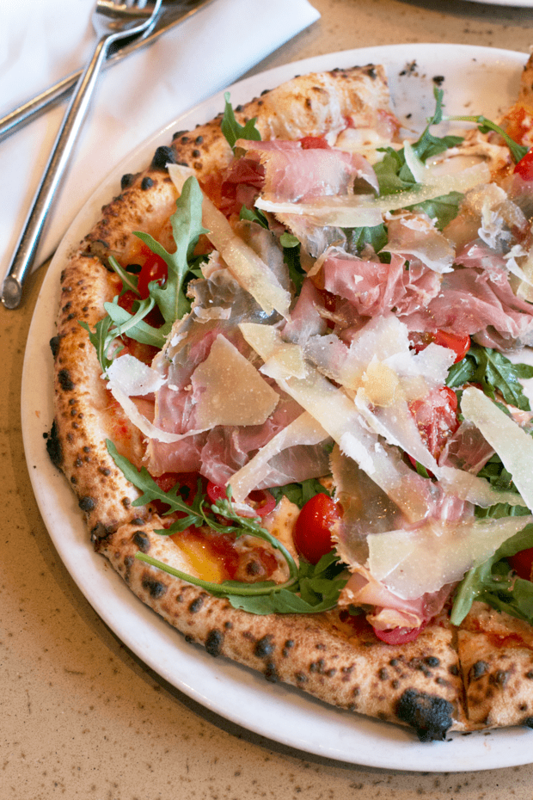 The crispy, warm and soft dough each pizza sits on transports me right back to the streets of Italy. Whenever I come here, I highly recommend sitting on the patio so you can people-watch along with your pizza and cold brew. The char of the dough, the beer, and the fans pouring into or out of the stadium in the summer is a prime Denver experience in the making, my friends. Next on the Denver pizza and beer list? East Colfax. The East Colfax neighborhood has been going through a revitalization for the past handful of years, and the result has been all sorts of tasty. From restaurants to bars, breweries to unique shops, the stretch of Colfax that used to be a little tired is now full of life. 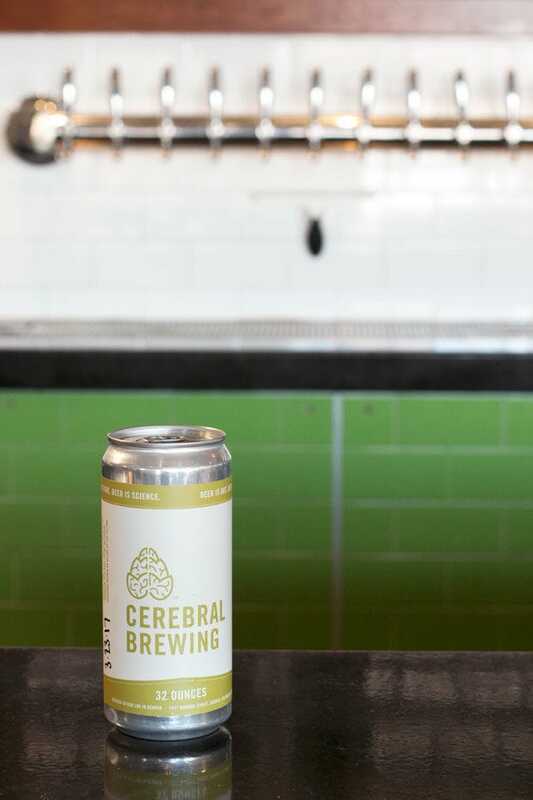 Cerebral Brewing – this home brewing operation turned craft brewery is where science meets passion. 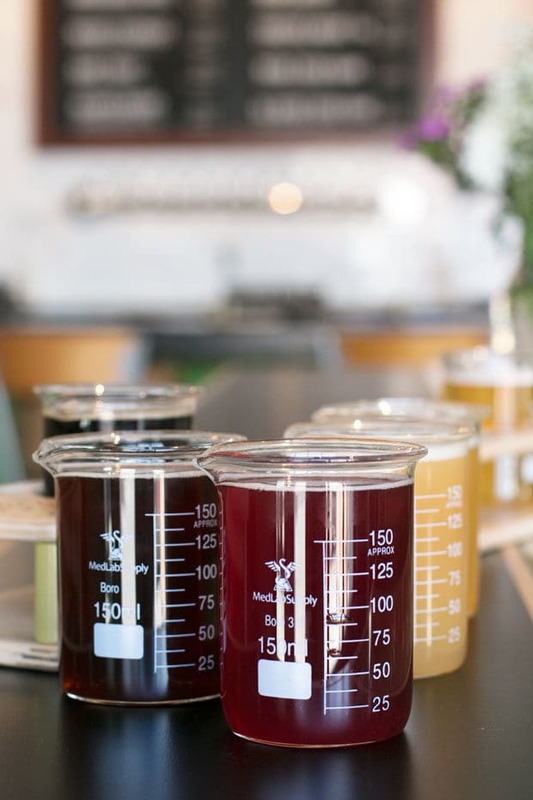 When you walk into the bright and light tap room, you feel like you’ve walked into a homey lab. From the lab-like high-top tables to tasters served in beakers, you can’t help but smile at how much science has been embraced here. I chat with a lot of brewers who are focused on the science of beer-making, however it’s usually behind the scenes. 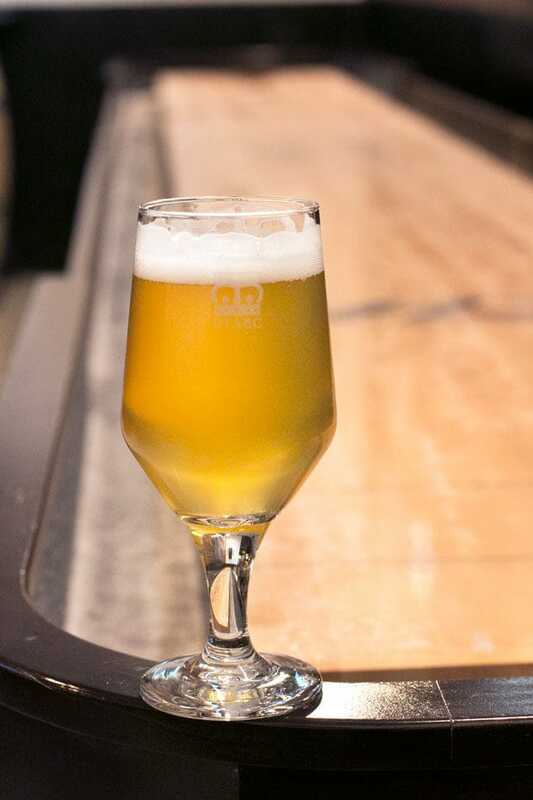 Cerebral Brewing puts that science front and center with a heavy emphasis on saison and brett. The primary focus here is on balance. Balance between flavors down to balance between science and art. In such a mature market, it’s refreshing to see a newer brewery come in with such a strong identity, and a strong sense of the Denver brewing community. Make sure you hit them up on a warm day because their patio is to die for. 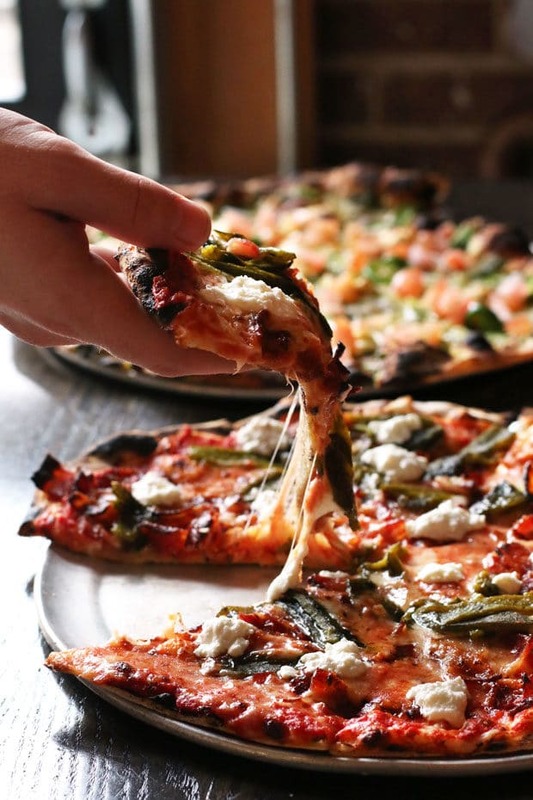 Fat Sully’s New York Pizza – located in the same building as Denver Biscuit Company and the Atomic Cowboy on Colfax, Fat Sully’s slings up New York style pizza slices that satisfy my craving oh-so much more than any other New York style pizzeria does in this area. 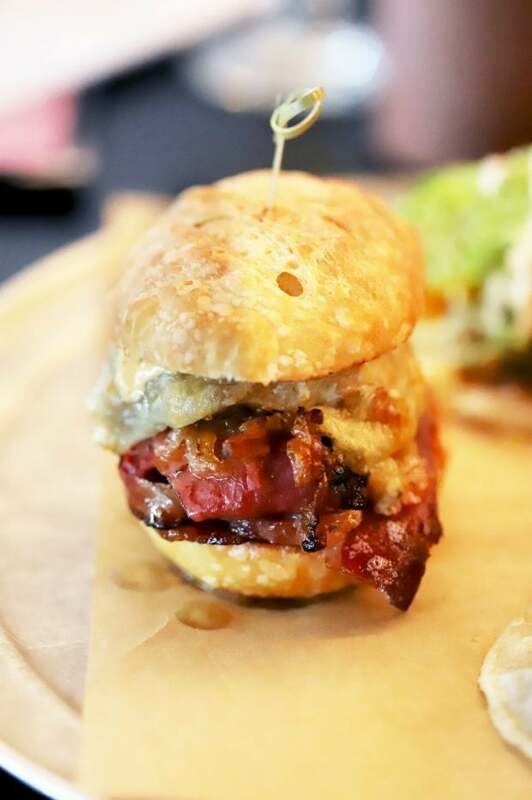 The thin slices that are the size of your freaking FACE are fresh, hand-tossed and impossible to not finish. Recommended Bites: I always encourage you to make your own pizza or slice with this style of pizza, but if you want to know my personal favorite combination… Jalapeños, pepperoni, garlic, and red pepper flakes is made for all you meat-lovers and spicy fanatics. Tennyson Street is an area of Denver that I personally had not tapped into until recently (to the chagrin of many of my friends and the Man). The stretch between 32nd and I-70 holds a new host of bars, restaurants and boutique shops, with more construction going on all the time. It’s one of those hidden gem streets that feels like a tiny town, without that “too small town-y” vibe. I actually have a couple of Denver pizza and beer pairings in this neighborhood, so get prepared for a double-dose of DELISH. All-In-One Stop = Hops & Pie. If you don’t want to limit yourself to one brewery, then the all-in-one spot to hit on Tennyson Street is definitely Hops & Pie. OMGGGGG this place is the bomb diggity. They’ve been open for 8 years and not only have they survived the insane transformation in the area… they have thrived. It smells like pizza heaven from the moment you walk in, reminding me of the pizzerias in Rome. While they offer some killer sandwiches and tacos, if it’s your first time there you HAVE to get the pizza. All of their dough and bread is made in house (the pizza dough being a 1:1 ratio of water and beer – yea, that’s right, I said BEER) so you get the freshest, most delicious flavor every single time you visit. 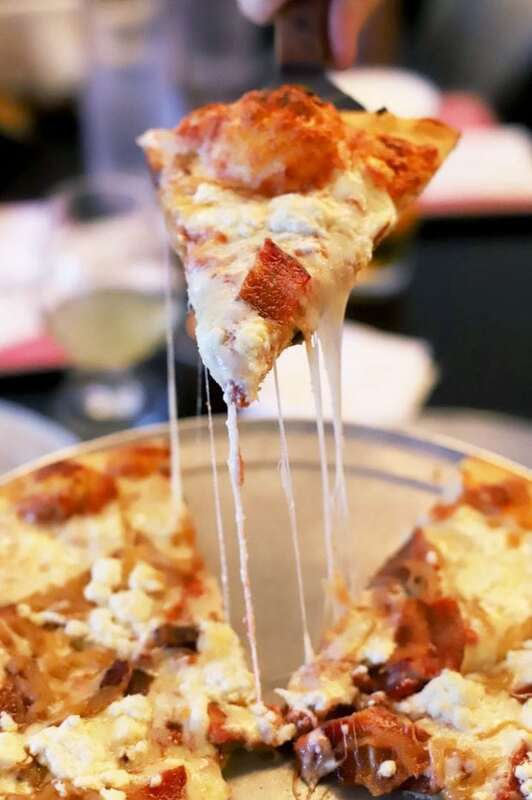 Recommended Bites: Pizza (DUH) with whatever toppings you want (I suggest bacon, goat cheese and caramelized onions because holy WOW it’s pure genius). The reuben is AMAZING, served on housemade bread with bacon slaw and meats that are all smoked in house – it literally melts in your mouth. Macaroni and cheese made with an IPA sauce is the only mac and cheese I crave because if it’s rich flavor without feeling too heavy. 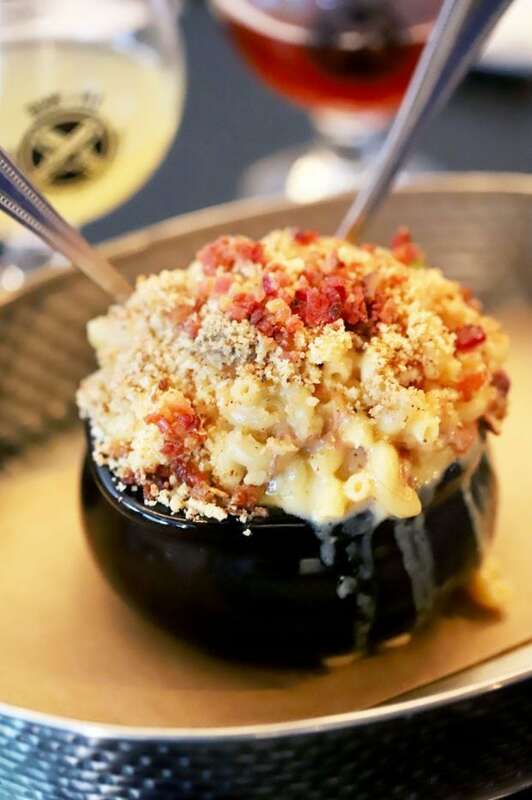 Plus it has bacon, hamhock, and peas so it reminds you of hot dogs and mac ‘n cheese as a kid – but all grown up! 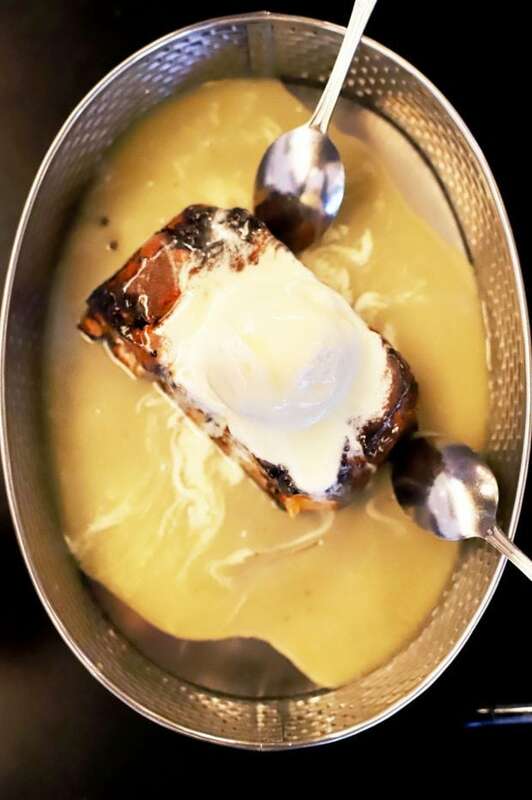 Be sure to end your meal with their giant bread pudding topped with a warm bourbon sauce that I wish I could take a bath in. It is HEAVEN. 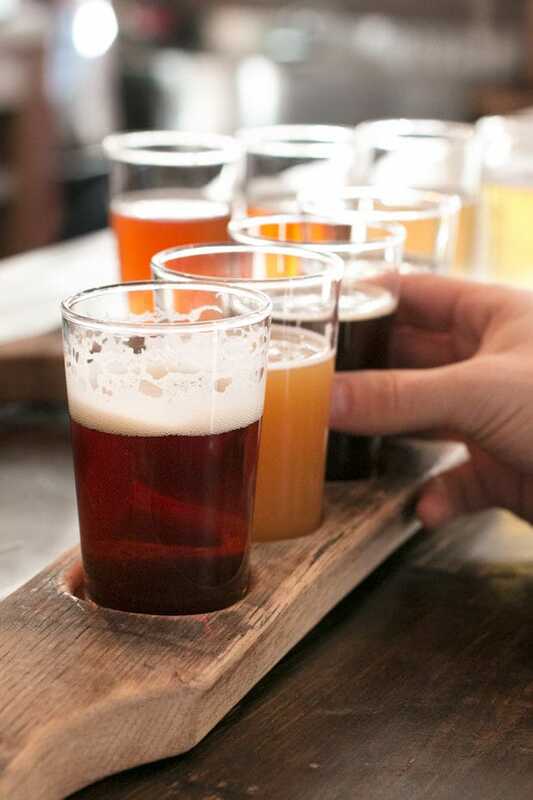 Recommended Sips: Literally ANYTHING on their rotating tap list is worth trying. 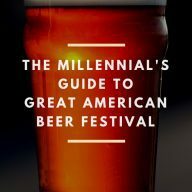 You can indulge in a full glass, a flight, or take a gander at their giant bottle list if you want to be a real beer snob (hey, no judgement here, I’ve done it before when I’m feeling fancy). The drafts are mostly local but some are from around the U.S. and they are known to be one of the best beer spots to hang at in town. Looking for a deal? Saturdays between 12pm and 5pm you can get 2 slices and 3 drafts for $16. Wednesday is $2 craft can night and on Tuesday you can pick up an 18-inch 2 topping pizza and 2 drafts for $25. WOOT. 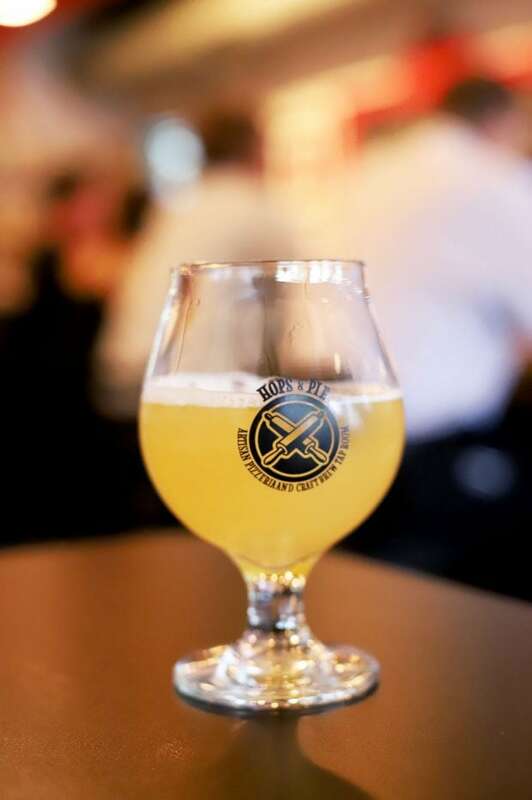 Call to Arms Brewing Company – the moment you walk into the taproom, you get an immediate sense of the “old world meet new” start that Call to Arms Brewing Company had. 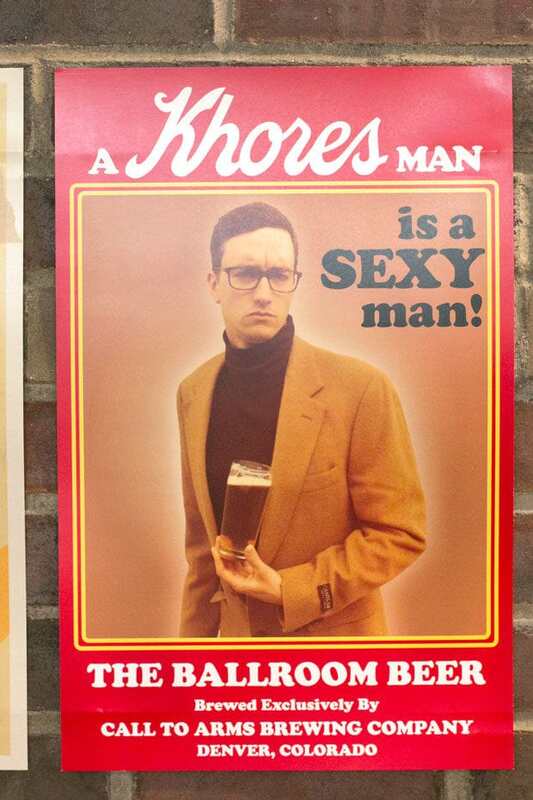 The English-style beer hall has a lively, fun and rustic feel from the shuffle board game in the back, to the wooden bar and humorous posters lining the walls. The three fellows who started the brewery all met while working at Avery Brewing Company and broke off to form their own, community-focused brewery – and the amount of passion and care shows in the beers they create. Really, their motto says it all – Quality. Community. Camaraderie. Honestly, this brewery is one of the reasons I’d love to live in the area because there is such a sense of community. They even launched a CTA Good Samaritan Program that will throw you a beer at the end of hours worked at a charity, encouraging the Denver beer community to give back. 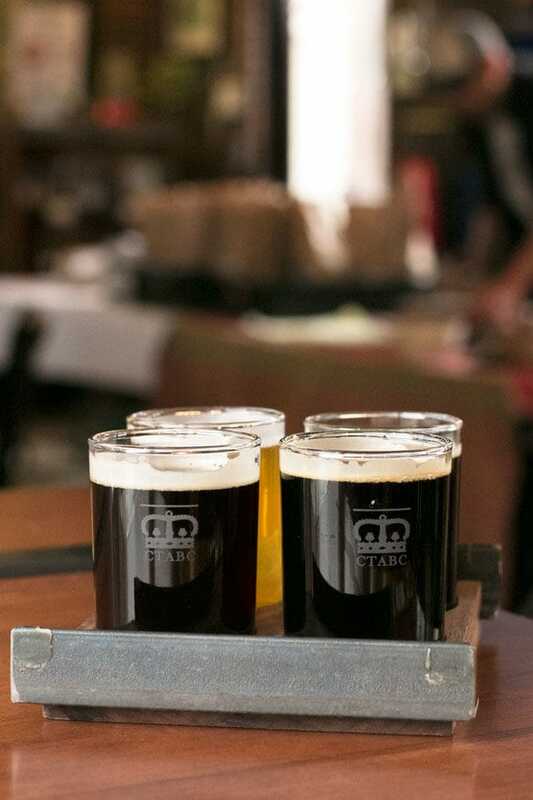 You’ll find a real sense of home at this beer hall, with core and seasonal beers that boast bold, balanced flavors. Plus you can eat Mas Kaos (see below) pizza without having to walk further than next door as you down a few beers in the beer hall. BOOM baby. Mas Kaos Pizzeria & Taqueria – I know that the title of this restaurant includes tacos, but the reason you come here is 100% for their PIZZA. The fresh brick oven cooked pizzas come flying out of the oven quickly with a variety of toppings that are an exploration for your taste buds. With Call to Arms Brewing Company beers on tap, you can kick back in this funky spot for hours (especially with their happy hour running from 11:30am to 6pm). You can even order a pizza and have it delivered to Call to Arms right next door if you are more into trying a flight of their delicious beers and don’t want to go ping-ponging back and forth all night long. 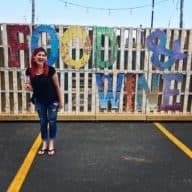 Disclosure: As part of this post, I was invited to enjoy personal experiences at all restaurants and breweries listed above for Denver pizza and beer. All opinions are still my own! Thank you for supporting the brands that support Cake ‘n Knife! 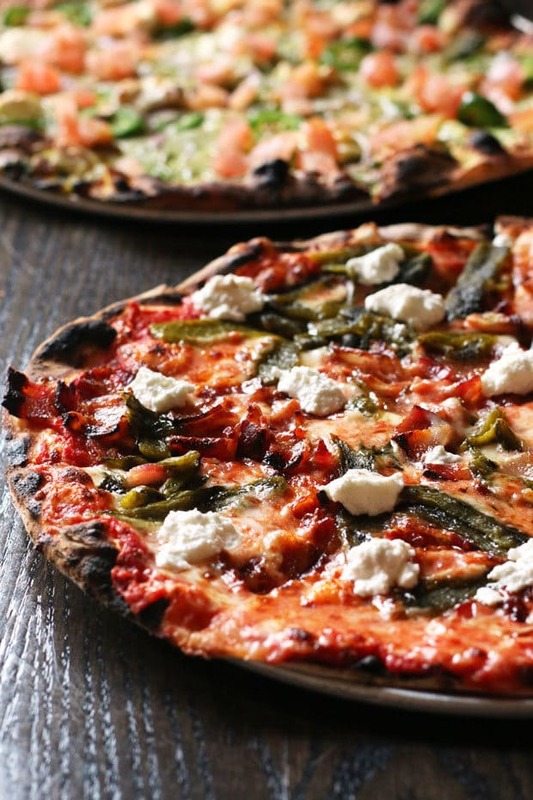 Pin this Ultimate Guide to Denver Pizza and Beer for later! 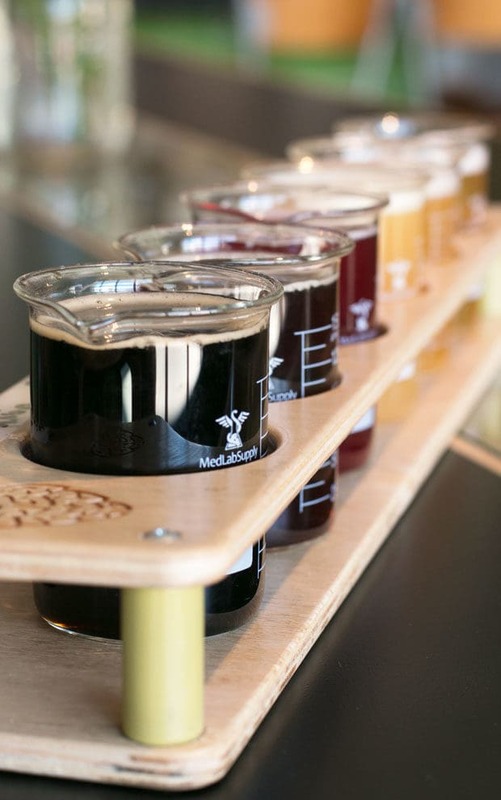 if you find your way back to Tennyson St, be sure to check out DeSteeg Brewing! YES I just went there this past weekend and LOVED it! Great patio spot!